In our novel Der Stolperstein (Stumbling Stone), there is a scene where Karl’s mother recalls her experience during the end of World War II as the Allies were bombing Dresden. She describes her flight, eight months pregnant, with two toddlers, as she tries to get somewhere ahead of the Russians. “We had it hard during the war, we women,” she says. Since the novel is based on our true life stories, that excerpt is pretty much verbatim what Rudi’s mother told me the first time we met, when I was in my hyper-vigilant, everyone-was-a-Nazi phase. And she had been a Nazi. But I confess that I hadn’t stopped to think about what the German civilians were doing during the war and especially near the very end of the war when the Allies’ policy was to bring Germany to her knees so that Hitler would surrender. Rudi and I read her story when we did book events for the English version of our novel. It provided a perspective we didn’t think many Americans had. We didn’t read it on our recent book tour in Germany. Little cathedral square in Paderborn was destroyed in an air raid two weeks before the end of the war. More recently, we often take visitors to a National Monument in our city. The Rosie the Riveter museum commemorates the work of civilians in the Richmond, California shipyard during the war. An extraordinary number of Liberty ships were manufactured in record time by men and women who poured into the city from all over the country to help the war effort. Rudi has very uncomfortable feelings about that museum. The ships transported the materiel necessary to kill Germans. 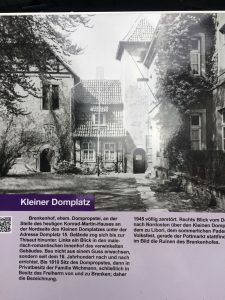 During my first several trips to Germany, I saw a number of plaques on buildings acknowledging that a street or neighborhood had once been the home of Jews. Later, we began to see bronze stumbling stones and other much more visible remembrances of the atrocities. The Germans were getting better at acknowledging what happened, but the Jews were gone. At nearly all the events on our book tour, there were no Jews in the audience. Among the German words I learned early in my trips to Germany—along with how to count, where is the bathroom and words for different foods—were Ermordet (murdered). And Deportiert (deported) and Tot (dead). This gothic cathedral in Paderborn was destroyed by bombs but restored from photographs. On our German book tour this year, we had an event in Bad Lippspringe. It turned out to be our last event before we had to rush home so I could have emergency eye surgery,. 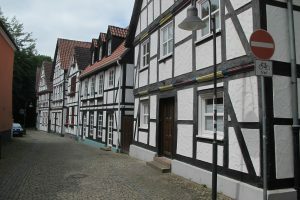 We stayed in a nearby town called Paderborn, which had been a medieval village. It was founded in 795 by Charlemagne. With just a few extra hours, we went to the church museum and there I learned a few more German words. Paderborn was bombed, along with many other Germany towns and cities, in the waning days of World War II. Bombed to smithereens you might say. It was bombed by Allied aircraft in 1944 and March of 1945- just weeks before the end of the war. Eight-five percent of the town was destroyed, including many of the historic buildings. So along with the German words I saw on the stumbling stones, in many Germany towns I also read bombardiert (bombed), zerstört (destroyed), rekonstruiert (reconstructed). 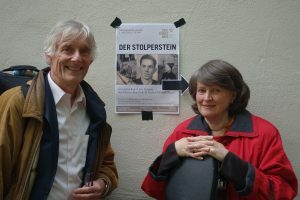 Musicians Friedrich Edelmann and Rebecca Rust inspired the book tour and did most of it with us. Thank you! When bassoonist Friedrich Edelmann first suggested that we do a combined book reading/concert with him and cellist Rebecca Rust at Book Passage in Corte Madera, Californa, more than a year ago, we agreed, but with less than wild enthusiasm. It was the end of our second year of doing events for our novel Stumbling Stone and we were ready to move on to another adventure. We agreed, more to support them as musicians than to promote our book. 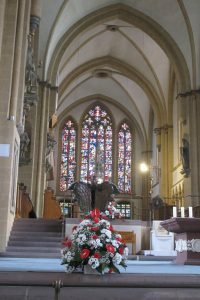 The event, with them playing music composed by German Jews who fled the Nazis, was a great success and Friedrich enthusiastically suggested we come to Germany and do a book tour there. Rudi said no. After he translated the book into German— a year of blood, sweat and some tears—and after we spent months putting the book tour together, we flew off to Frankfurt. Eleven events and one detached retina, we’re home. What an experience! Thanks to Friedrich and Rebecca for their inspiration and to everyone else who supported us. This concludes the blogs we’ve been writing.